Best animation performance in Silverlight 4 is obtained from the combination of procedural animation and a pixel shader, as reported in a previous blog. A pixel shader is not really meant to be used for spatial manipulation, but in Silverlight 4 vertex and geometry shaders are not available. Also, pixel shaders are limited to Model 2 shaders in Silverlight 4, and only limited data exchange is possible. The question is then, “how far can we push pixel shaders model 2”. Another previous blog post discussed a preliminary version of dispersion. This post is about Expansion. The effect is much like Dispersion, but the implementation is quite different – better if I may say so. Expansion means that a surface, in this case a playing video is divided up in blocks. These blocks then move toward, and seemingly beyond the edges of the surface. The pixel shader was created using Shazzam. The first step is to reduce the image within its drawing surface, thus creating room for expansion. Expansion is in fact just translation of all the blocks in distinct direction that depend on the location of the block relative to the center of the reduced image. In the pixel shader below, parameter S is for scaling, reducing, the pixel surface. Parameter N defines the number of blocks along an axis. So if N = 20, expansion concerns 400 blocks. In the demo App I’ve set the maximum for N to 32, which results in 1024 blocks tops. Parameter D defines the distance over which the reduced image is expanded. If the maximum value for D is the number of blocks, all the blocks (if N is even), or all but the center block (N is odd) just ‘move off’ the surface. The code has been commented extensively, so should be self explanatory. The big picture is that the reduced, centered and then translated location of the blocks is calculated. Then we test whether a texel is in a bloc, not in an inter block gap. If the test is positive, we sample the unreduced, uncentered and untranslated image for a value to assign to the texel. // iM is a kind of macro, reduces calculations. The above shader is used in an App that runs a video fragment, and can be explored at my App Shop. The application has controls for image size, number of blocks, and distance. 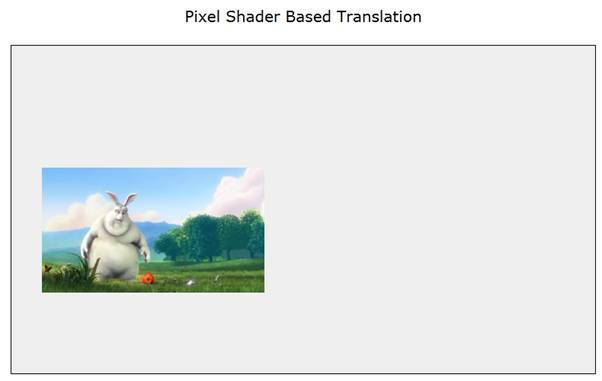 The video used in the application is a fragment of “Big Buck Bunny”, an open source animated video, made using only open source software tools. Each of the above controls can be animated independently. Animation is implemented using Storyboards for the slider control values. Hence you‘ll see them slide during animation. The App is configured to take advantage of GPU acceleration, where possible. It really needs that for smooth animation. Also the maximum frame rate has been raised to 1000. The animations run at about 225 FPS on my pc. This requires significant effort as from the CPU –about 50% of the processor time. The required memory approaches 2.3Mb. Best animation performance in Silverlight 4 is obtained from the combination of procedural animation and a pixel shader, as reported in a previous blog. I know, a pixel shader is not really meant to be used for spatial manipulation. However, in Silverlight 4 vertex and geometry shaders are not available. Also, pixel shaders are limited to Model 2 shaders, and only limited data exchange is possible. The question is then, “how far can we push pixel shaders model 2”. Another previous blog post discussed a preliminary version of dispersion. This post is about Panning. Panning means here that the size and coordinates of a sub frame of, in this case a video, are changed. The pixel shader was created using Shazzam. The first step is to reduce the image within its drawing surface, thus creating a frame that works as a window through which parts of the video are visible. Panning is in fact just changing the coordinates of this window while correcting for the change in coordinates when sampling the source texture. In the pixel shader below, the BlockSize in [0, 1], BlockX, and BlockY, both in [0, 1] define the panning window. The Bound function centers the panning window for coordinate values of 0.5. In the Main function, the ‘space’ variable denotes the available space to move the panning window around in. BlockH and BlockV denote the topmost horizontal and leftmost vertical edges of the panning window. We use these to filter input coordinates that sample the color texture. Other texels get assigned the background color of the demo application. The above shader is used in an App that runs a video fragment, and can be explored at my App Shop. 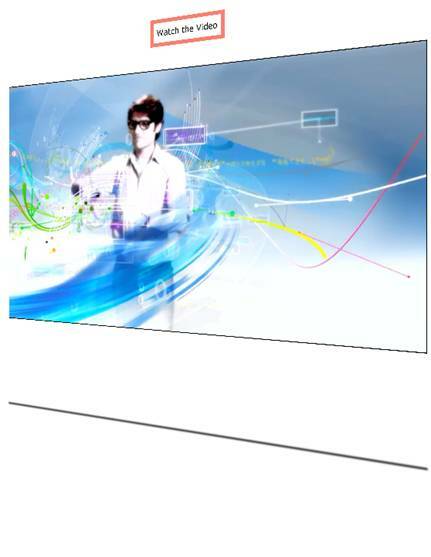 The application has controls for panning window size, X-coordinate and Y-coordinate of the panning window on the video surface. The video used in the application is a fragment of “Big Buck Bunny”, an open source animated video, made using only open source software tools. The animations run at about 270 FPS on my pc. This requires both significant effort from both the GPU as from the CPU – both about 35% of the processor time. The required memory approaches 2.2Mb. Best animation performance in Silverlight 4 is obtained from the combination of procedural animation and a pixel shader, as reported in a previous blog. I know, a pixel shader is not really meant to be used for spatial manipulation. However, in Silverlight 4 vertex and geometry shaders are not available. 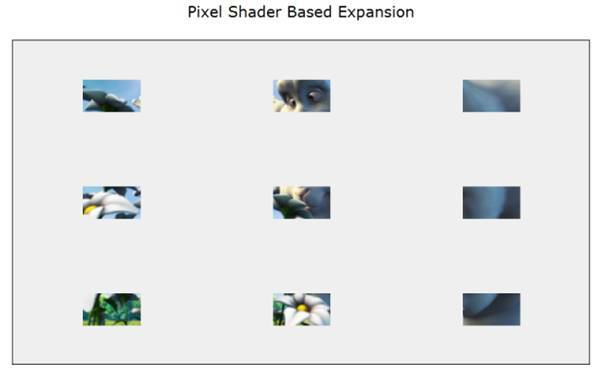 Also, pixel shaders are limited to Model 2 shaders, and only limited data exchange is possible. The question is then, “how far can we push pixel shaders model 2” Another previous blog post discussed a preliminary version of dispersion, which is fairly complicated. This post is about translation. Translation means here that the coordinates in the 2-dimensional plane of a reduced image, in this case a video, are changed. The pixel shader was created using Shazzam. The first step is to reduce the image within its drawing surface, thus creating the room required for translation. Translation is in fact just changing the coordinates of the reduced images while correcting for the change in coordinates when sampling the source texture. The pixel shader below, the if statement does the filtering. Left and Right are parameterized offset and cutoff values. The offset ‘Left’ is also used to correct for the displacement in sampling. Sampling is done by the ‘tex2d’ function. at my App Shop. The application has controls for video surface reduction, translation along the X-axis, and translation along the Y-axis. 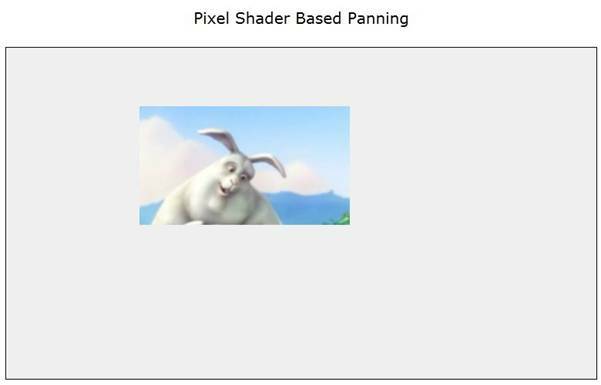 The video used in the application is a fragment of “Big Buck Bunny”, an open source animated video, made using only open source software tools. Each of the above controls can be animated independently. Animation is implemented suing Storyboards for the slider control values. Hence you‘ll see them slide during animation. I didn’t use procedural animation, since, as discussed in the aforementioned previous blog post, is hindered by the implementation of the MediaElement. The App is configured to take advantage of GPU acceleration, where possible. It really needs that for smooth animation. Also the maximum frame rate has been raised to 1000. The animations run at about 250 FPS on my pc. This requires both significant effort from both the GPU as from the CPU. The required memory reaches a little over 3.5Mb.